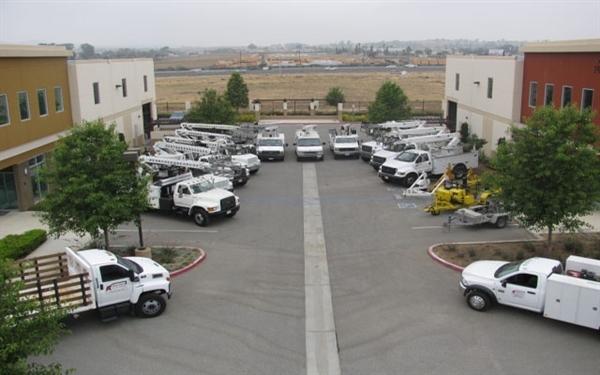 Rentals Bucket Trucks-Cable Lashers- Pole Trailers Do you have an aerial construction project but need equipment? Let us help you! Call Denise at 1-800-256-5186 or email denise@aaerial.com. We have competitive rates and will work with you to help meet your needs. Must provide current proof of liability and comprehension insurance for the full value of the vehicle being rented. A-Aerial Service Company must be named as additional named insured/loss payee on the certificate of liability insurance as well as the vehicle value and vin number. Lessee is aware that the truck is renting month to month, the date can be extended if needed. A-Aerial Service Company must be given a copy of the certificate of liability before the time of rental. Lessee is responsible for tail light damage, wiring damage due to overloaded bins, impact damage to boom and any front end alignment damage. Lessee is to make repairs within 30 days. If repairs are not made within 30 days , A-Aerial will make repairs and bill lessee. Lessee is responsible for maintenance including engine oil changes, and chassis lubrication at 90 day intervals. All traffic laws and licensing requirements for drivers of this unit must be met. The lessee will be responsible for all citations issued. You are to notify A-Aerial within 72 hours of an accident. A signed rental agreement is required prior to release of rental units. Certificates of insurance are required prior to release of rental units. Credit approval is required prior to release of rental units. Major credit cards will be accepted with a signed credit card authorization form. Rentals are charged on a time-out through time-in basis. All delivery and return shipping and handling are the responsibility of the customer. Monthly rentals are charged on a 30 Day Billing Cycle. Weekly rates are one-third the monthly rental rates. Some rental units may have a minimum rental period. Some truck rentals require special drivers licensing. Monthly and weekly rates will only be prorated after the first full billing cycle. All damages, missing parts, tire wear, and fuel charges are the responsibility of the customer. Lease to own options may be available for some units. No rental credit due to inclement weather.